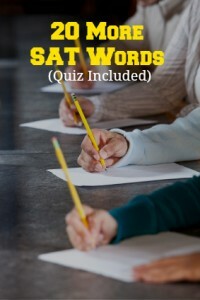 Here’s my second post on common SAT words. The first post is here. Below are 20 words randomly selected from one of those lists and their definitions. Click on the word for a more detailed definition on Merriam-Webster.com. Below the list is a link to a quiz on these 20 words. Please share this list with students who will be taking SATs in the future. Click Here To Take the Quiz on These 20 Words! I’d love your to read your comments and suggestions. Please leave a reply below.